Manila—(PHStocks)—Philippine stocks extended their gains Thursday, 3 October, as Moody’s Investors Service—one of the big three credit ratings firms in the world—showed its approval of the current economic growth track of the country, ongoing fiscal and debt consolidation, political stability and improved governance by giving the Philippines its third investment grade rating today. Moody’s raised the Philippines government debt rating one level to Baa3. 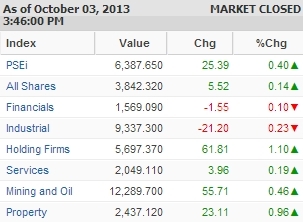 This has lifted the mainboard Philippine Stock Exchange index (PSEi), which gained 0.4% to 6,387.65. Leading the gaining counters is the Holding Firms sector, which gained 1.1%. Some counters, however, suffered selloffs—albeit minimally—amid the surge from the day before. In particular, the Industrials slid by 0.23% while the Financials dropped just by a point. Trading was moderate. Value turnover reached PhP6.11 billion on 921 million shares traded. There were 62 gainers today against 72 losers, while 52 stocks were flat. Today’s most active stocks in terms of value include Universal Robina Corp. (URC, PhP123.00, 1.23%), Alliance Global Group Inc. (AGI, PhP24.70, 2.92%), Metropolitan Bank & Trust Co. (MBT, PhP84.70, 0.71%), Philippine Long Distance Telephone Co. (TEL, PhP3,040.00, 0.40%), Metro Pacific Investments Corp. (MPI, PhP4.63, -1.07%), JG Summit Holdings Inc. (PSE: JGS): PhP40.80, -0.12%), BDO Unibank Inc. (BDO, PhP75.90, -0.13%), Ayala Land Inc. (ALI, PhP28.30, 0.89%), SM Investments Corp. (SM, PhP817.00, 2%), and International Container Terminal Services Inc. (ICT, PhP102.00, -0.87%).